Q: Foreign Minister Wang Yi will attend the open ministerial meeting of the UN Security Council on the Korean nuclear issue in New York. The media have generally predicted that some countries may use this meeting to drive the Security Council to coordinate position on addressing the threats of DPRK nuclear and missile programs and plan for fresh sanctions on the DPRK. What is China's comment and position? A: I've noted the analysis and remarks of the media and the recent statements of some countries. The situation on the Korean Peninsula is complicated, delicate and highly tense. At such a critical moment, various sides should fully discuss at the open ministerial meeting of the Security Council how to ease the current tensions, maintain peace and stability of the peninsula, advance denuclearization on the peninsula, and ultimately resolve the Korean nuclear issue properly. If the meeting only focuses on scaling up sanctions and pressure on the DPRK, it may not only miss a rare opportunity but also escalate confrontation among various parties and undermine current efforts to promote peace and dialogue. China will take an active part in the meeting with a constructive attitude and will have full and in-depth exchanges of views with relevant parties. We hope this open ministeral meeting can send out a positive and balanced message on resolving the Korean nuclear issue. Q: US President Trump said in an interview yesterday that a major conflict with the DPRK was possible, but he would prefer a diplomatic solution. He also praised President Xi Jinping for his contribution to resolving the Korean nuclear issue. This seems to be President Trump sending a very positive signal about China's contribution towards resolving the DPRK issue. What is your comment on that assessment? A: I already stated our position when answering questions of journalists yesterday. We've noted the recent remarks of some US senior officials and the message of expecting peaceful settlement of the Korean nuclear issue through dialogue and consultation conveyed in them. We think the message is positive and constructive and should be welcomed. As I stressed yesterday, dialogue and consultation is the only right path towards the solution of the Korean nuclear issue, and peaceful settlement best serves the interests of all parties involved. Therefore, we are willing to work with all parties concerned to push forward peaceful settlement of the issue. As I said, we hope all sides can have in-depth exchanges of views on seeking proper and lasting settlement of the Korean nuclear issue at the coming open ministerial meeting of the Security Council, and send out a balanced and positive message. Meanwhile, the leaders of China and the US have maintained close communication and exchanged views on bilateral relations and issues of common interest in a timely manner, which is good for both the two countries and the international community. The two presidents had an in-depth exchange of views on the Korean Peninsula situation during their meeting at Mar-a-Lago. 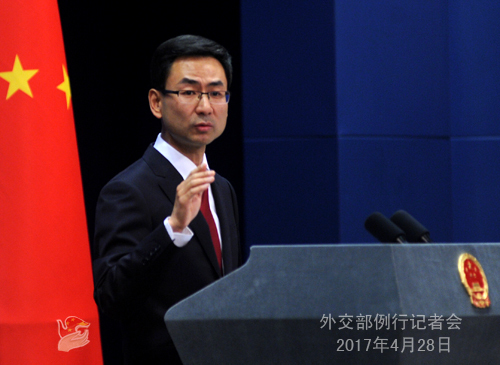 Going forward, China is willing to work with the US and other relevant parties to push forward the settlement of the Korean nuclear issue. Q: My question is also about the open ministerial meeting. It is believed that apart from pushing forward stronger sanctions on the DPRK at the meeting, some countries may also stress the key role of China in resolving the Korean nuclear issue, and require China to put more pressure on the DPRK and play a bigger role in resolving the issue. What is your view? A: China has made unremitting efforts to resolve the Korean nuclear issue for a long time and has played an important and constructive role all along. 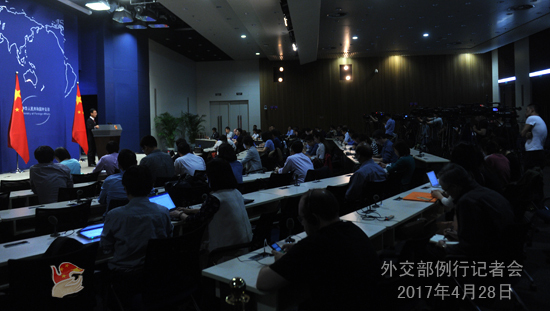 China is the chair of the Six-Party Talks, and the September 19 Joint Statement was passed exactly with the efforts of China as the chair. As a permanent member of the UN Security Council, China supported it in adopting resolutions concerning the DPRK and has always earnestly and strictly implemented them in their entirety. It is fair to say that China's efforts to facilitate the settlement of the Korean nuclear issue are indispensable and its contribution widely recognized. Recently, China has put forward the dual-track approach and the "suspension for suspension" initiative. China's proposal is gaining understanding and support of more and more countries. We also welcome constructive opinions from other sides. I'd like to emphasize again that China is not at the center of the conflicts concerning the Korean nuclear issue. It is also not the cause of the escalation of the situation on the peninsula. The key to the issue is not within the grasp of China. Instead, it takes collective wisdom and joint efforts to resolve the issue. 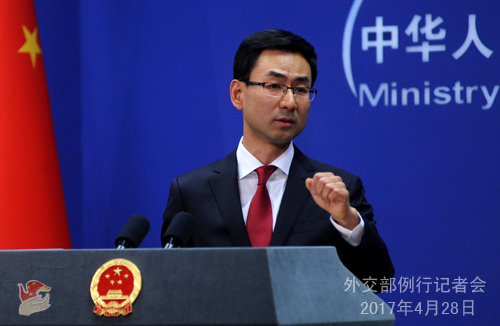 China hopes that the relevant parties can play their due role, shoulder their due responsibilities, and make joint efforts with China to resolve the Korean nuclear issue and maintain peace and stability in Northeast Asia. Q: China always opposes unilateral sanctions regarding the Korean nuclear issue. However, it is reported that US Secretary of State Tillerson said the Chinese side expressed to the US government its readiness to impose unilateral sanctions on Pyongyang should there be another nuclear test by the DPRK. Can you confirm it? A: .As for what measures China woud take if the DPRK conducted another nuclear test, it is a hypothetical question and I will not comment on it. We've stressed many times that the UN Security Council has clearly prohibited nuclear and missile programs of the DPRK. China's position is very clear: we oppose any action in violation of Security Council resolutions. Q: US Secretary of State Tillerson said that the US is open to direct talks with the DPRK. What is China's response to that? Given the tensions between the US and the DPRK, is China offering the DPRK new guarantees of security or other signs of support? A: Regarding Secretary Tillerson's remarks, I've clearly explained China's position when answering another question earlier. We've noted the remarks and the positive message in them. 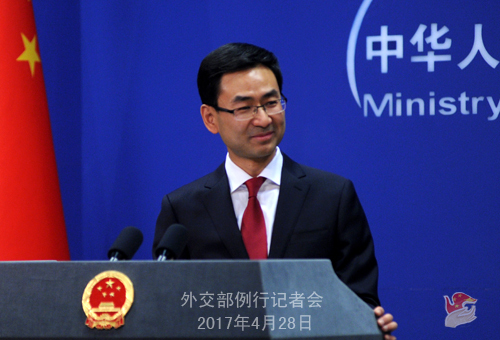 China always encourages the relevant parties to enhance communication and peacefully resolve the Korean nuclear issue through dialogue and consultation ultimately. We are ready to make use of the open ministerial meeting of the Security Council to have in-depth exchanges of views with all sides on how to settle the issue. We also hope the relevant parties can work towards the same direction and make joint efforts to push forward peaceful settlement of the issue. As for the China-DPRK relationship, as we've said many times, China and the DPRK are close neighbors with a history of friendly exchanges. China's position on the Korean nuclear issue is clear-cut and familiar to the DPRK. Q: President Trump was asked yesterday about his attitude towards another potential call with Taiwan's Tsai Ing-wen. This is after Tsai Ing-wen appeared not to rule out another phone call with President Trump. However, President Trump appeared to express no interest in this, saying that it would create problems for China. In other words, he basically rebuffed this suggestion from Tsai Ing-wen. Is this a position of President Trump that China welcomes? A: We've noted the US reply, which we believe the Taiwan side should have also noted. We always oppose official exchanges in any form between the Taiwan side and countries that have diplomatic ties with China. This position is very clear and resolute. Q: We've noted that the website of the Ministry of Foreign Affairs forwarded yesterday a statement of the Fugitive Repatriation and Asset Recovery Office of the Central Anti-Corruption Coordination Group on the hideouts of some fugitives suspected of abuse of power and economic crime. Could you tell us what the foreign ministry and embassies and consulates abroad have done in anti-corruption and international fugitive repatriation and asset recovery? A: Corruption, as a tumor that harms social development, is abhorred by people. International fugitive repatriation and asset recovery is an important chain in the combat against corruption and also an important part of diplomatic work. At our foreign ministry and embassies and consulates abroad, we have always done our best to cooperate and actively assist domestic competent authorities in relevant work. So far, 40 on the 100-person most wanted list have been brought to justice. China has concluded treaties of legal assistance in criminal matters with 59 countries and extradition treaties with 48 countries, basically forming a network of fugitive repatriation and asset recovery covering major countries in all continents. Meanwhile, through channels such as the China-US Joint Liaison Group on Law Enforcement Cooperation and the China-Canada consultation on law enforcement and judicial cooperation, China has established long-term and effective communication and cooperation mechanisms with key countries in anti-corruption and fugitive repatriation and asset recovery. Under the mechanism and framework of the Anti-Corruption Summit and the UN, we have taken an active part in and steered international rule-making, further built up international consensus on combatting the crime of corruption, and strengthened the will of countries to conduct cooperation. The determination of the Chinese government to firmly combat corruption and its goal of resolutely stemming the spread of corruption remain unchanged. The foreign ministry and embassies and consulates abroad will continue promoting international cooperation on anti-corruption actively, weaving a tight "Sky Net" in fugitive repatriation and asset recovery, and making our due contribution to the overall anti-corruption efforts of our country and to social fairness and justice. Q: During the election, President Trump criticized China. After he won the election, he took the phone call from Tsai Ing-wen. All these raised concern in China. It seems that recently, President Trump has realized that China and President Xi are his good friend. The bilateral relationship seems to be at the moment very close and cooperative. President Trump appears to have realized that this is also in his interest, that the relationship with China is very important and he doesn't want to upset China. How does China view its ties with the US? Is China glad about the current relationship? A: The China-US relationship is one of the most consequential bilateral relationships not only for the two countries but also for the world. Your question is a big one and it may take an hour to answer it. (laughs) Here I will be brief. China's attitude is clear and consistent. We are always ready to develop a sound and steady relationship with the US on the basis of mutual respect and win-win cooperation. Since President Trump took office, President Xi Jinping has stayed in close contact with him through various means, and they have established good working relations as well as personal friendship, which is significant for the development of bilateral relations. At present, the two sides are following through the important agreements reached between the two presidents and developing the relationship along the right track. The importance of the China-US relationship has gone beyond the bilateral scope. A good and sound China-US relationship serves the interests of not only the two countries but also the Asia-Pacific region and the whole world. We are always ready to work with the US to push forward sound and steady development of our relationship. Q: The United States Commission on International Religious Freedom (USCIRF) recently released its 2017 Annual Report, in which it continues to recommend listing China among the "countries of particular concern". What is your comment? A: The Chinese government protects the freedom of religious belief of citizens according to the law. Chinese people of all ethnicities and regions fully enjoy freedom of religious belief in accordance with the law. The fact is widely recognized and beyond doubt. The commission has always been full of political prejudices against China. Ignoring the progress China has made in religion, it releases reports year after year to smear China's religious policy and situation, and its fallacies do not even deserve refutation. We suggest the commission respect the fact, reject prejudices, and stop releasing relevant reports and interfering in China's internal affairs on the pretext of religious issues. Q: Is it true or not that China has given a message to Secretary of State Tillerson that China has warned the DPRK that it would take sanctions on its own if the DPRK conducted nuclear tests? A: The UN Security Council resolutions clearly prohibit nuclear and missile programs of the DPRK. Our position is clear-cut: we oppose any action in violation of the Security Council resolutions. We told the US so and the DPRK also knows our position well. Q: President Duterte said that there is no point in bringing up China's island-building at the ASEAN summit. Do you have any comment on this? A: We've noted the relevant statement of the Philippines. China's position on the South China Sea issue is consistent and clear. The Chinese side is ready to continue following the agreement reached between the leaders of our two countries, properly handle sea-related issues with the Philippines, and constantly create a favorable environment for the sound and steady development of the bilateral relationship as well as our practical cooperation in various fields. Q: The foreign ministry website has released information about the meeting between Foreign Minister Wang Yi and Russian Deputy Foreign Minister Gennady Gatilov at the United Nations. Could you give us more details or introduce the outcomes of their meeting? A: I believe you've read the press release and I have no more information to provide. But I want to stress that both Foreign Minister Wang Yi and Russian Deputy Foreign Minister Gennady Gatilov are there for the open ministerial meeting of the UN Security Council on the Korean nuclear issue. China and Russia share similar position and views on the issue. Russia has played a positive role in resolving the issue for a long time. Going forward, we are ready to continue enhancing communication and cooperation with Russia and all other relevant parties to jointly push forward peaceful settlement of the Korean nuclear issue through dialogue and consultation at an early date. In accordance with the holiday arrangements made by the State Council for the Labor Day, the regular press briefing of the foreign ministry will be adjourned on 1 May (Monday) and resumed on 2 May (Tuesday). During the adjournment, the Spokesperson's Office will receive questions via phone and fax as usual.